Want to send a postcard via Twitter? The agency Brands2Life have done just that as part of their work with at800 – the organisation raising awareness of the issues the 4G network might bring to Freeview users. 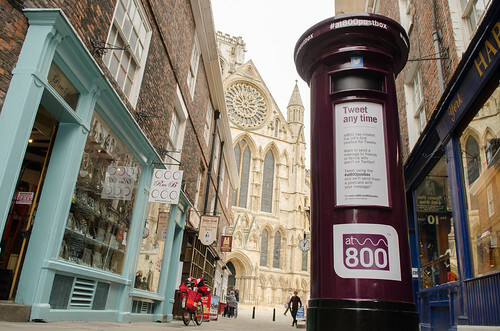 Their email informs me that if you send a tweet with the hashtag #at800postbox at800 they will print the personalised message onto a traditional postcard and deliver it by post for free. Really nice idea, although as it’s been described as a “PR stunt” by one Twitter user I suspect that it won’t be a permanent service. Shame really. Paul told me as I got on that someone had just tweeted how #Tweetbike was a murder waiting to happen which he found odd. What this perspective misses is that #Tweetbike isn't a pirely transactional service – it is driven by a deep social trust that Paul has built up through his personal network – both online and in the real-world. And it's this element that is key to the success of this – and potentially similar projects. The one drawback is that this kind of trust is difficult to scale in a mass marketised world.